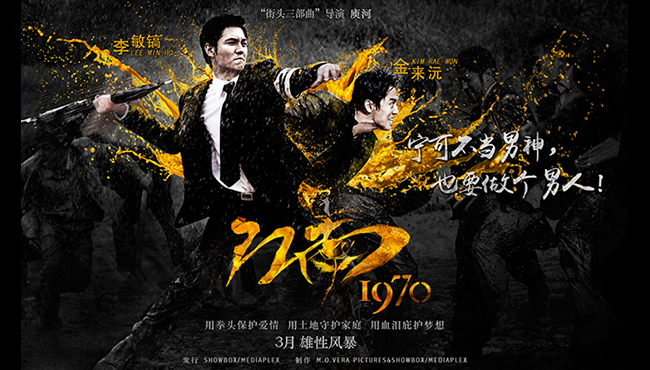 On February 6th, Showbox revealed its new poster for the Chinese released of Gangnam Blues. Set in hues of black and splashes of gold, the style has changed completely from the colder tones and desaturated colors of its Korean counterparts. Gangnam Blues opened in domestic theaters on January 21st, and as of February 5th, the film has sold almost two million tickets according to the Integrated Ticket Sales Network run by the Korean Film Council (KOFIC). Around that time, the film dropped to the lower half of the top ten chart, making way for new releases such as C’est si bon, Big Hero 6 and Jupiter Ascending, along with Ode to My Father which has climbed its way back up the rankings. However, since Gangnam Blues has been sold to all Asian markets and a few international ones, the film can expect LEE Min-ho’s strong fan base to bring up its international numbers. Director YOO Ha’s third installment in his ‘street series,’ Gangnam Blues is about two men who grew up together through the suffering of their town’s redevelopment program and have no choice but to turn to the dark world of crime in order to survive.